Lords Mobile: How to Reaching Tier 20 In Guild Fest. This guide is aimed at guilds with full membership and that is active with players that have played the game for a while. Players that should have decent enough research, equipment and castle levels. 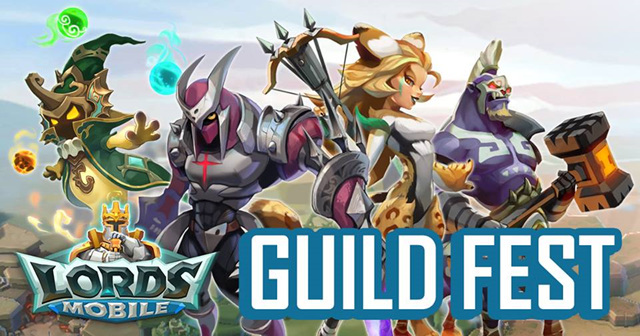 This means that anyone who reads this guide has already participated in at least 1 guild fest, and has some idea how it works, However, this guide will give a decently short explanation on how it works. And this guide was originally posted by AlmightySor on Lords Mobile Forum, thanks for share. If you are a guild leader redirect your guildies here, if u are an R1, redirect your R4s and leader here so that your guild has the best chance of succeeding. Guild fest appears every 3+- weeks, it has now appeared 2 days after the new kingdom clash event ends, and it lasts for full 7 days. 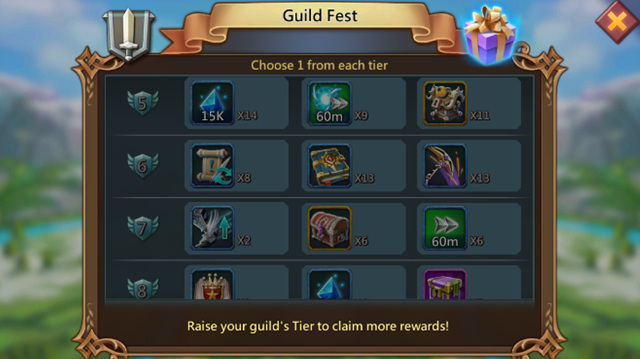 Guild Fest is a Guild based event, it depends on the success of your guild as a whole, and the more effort is put into it, the better the prices are. As an individual, in order to participate in guild fest, you have to be at least castle 15 and be in a guild before fest starts, if you join after it has started you will not be able to participate. As a guild, you need at least 25 players in your guild in order for your guild to qualify and participate. This means that if you are not a newbie guild, make sure all your members are active and meet requirements if you will to succeed and reach great rewards. When guild fest starts, your guild is paired with 19 other guilds from all across the game, you can be paired with a 20 mill might guild for Kingdom 7, or a 10 bill might guild for Kingdom 21. As you can see your opponents are random. From tier 4 all the way to tier 20, it jumps 4000 points every tier. With tier 20 needing 74000 points. Top 5 guilds that have also reached past tier 8 (26000 points), will receive an additional cross-guild reward that includes gems, speedups gold/wing speed boost/relocator, depends on the rank. Each tier nets greater and better rewards, every individual player gets different rewards. You get 3 rewards for each tier reached, you can only choose one of those 3.
you can claim this rewards at the end of the guild fest, they'll be up there for grab for 2 full days after fest ends. Do note that the rewards don't always have the same approximate value. You might get 15×2 hours research speedups or 10 cuffs, obviously, speedups are 10x better than the cuffs. The rewards contain basically everything. – Monster chests especially slayer chests which are only achievable otherwise through the in-game store. Best rewards are from tier 15, they get real amazing at 17 and epic at 19/20 mostly. We will explain about the quests in the next part, but you should know that if a quest is taken/deleted, next one will appear instead of it in 30 minutes. Also, you get 7 attempts and the 8th one for 1000 gems. Abandoning a quest is an attempt wasted, so if your kid or dog somehow clicked and started you a quest, if you can finish it fast do it if it is an impossible one only than abandon. Each quest has it's time limit as well, make sure you are aware of it, though some quests might take you much less time than specified and some are more. For example, if u are active and have a big enough army and good army capacity and gather speed, you should be able the 143 gather quest of 15mill wood for example in less than specified 1+ days, so no reason to take the same quest for 119 points which time stamp is 3 days. Now that we have covered the basics of how fest works. It's time to earn our 20th tier rewards. – Kick your inactive and alts. Make sure they meet the requirements. – Message your guild 1 week prior to guild fest to start saving gems, admin and guild scrolls, and coins. Only spend if absolute necessary like on relocators speedups and etc, but otherwise save. As an active guild, your guild should be making decent coins and scrolls and some gems from gift boxes. It's highly advised for your guildies to have 500k+ guild coins. – Choose some of your most active and devoted members to be R4 during guild fest, as R4s can delete quests. Choose them to be R4s for only the duration of the event as your guild will need constant refreshes so good quests will appear, as there are way more bad quests than the good one if you plan on reaching a high tier. – Set your guild a goal, Tier 20 is amazing but too hard for first-timers. The goal should include a tier to beat, minimum points for a quest, meaning that your R4s will delete any quest sub your minimum. And finally a minimum score for each individual at the end of the fest. Do a summary of how many people you had gone past 800 points, people that used their 8th attempt and etc. As you'll need an average of 740 points for 100 players to reach tier 20, so better have an assumption of how many players you will have done their minimum for that fest and how many will give their best and compete each other to be the king of the guild. Competition is best for success. – Motivate your guildies, do whatever to have your members motivated. – Not all players in your guild are permanent and might be leeching on the others, so don't be afraid to threat kicking whoever doesn't reach your set minimum. – During the fest , have your guildies call to save a certain quest they plan on doing soon, for example, someone has 50k gems he wants to spend, make sure to save him a 141 point quest for that. After reading this guide there'll be no excuse for your guild members do not have a minimum success or at least do 7 of their quests with a decent average. As an individual, to reach high points there are 3 types of people. 1. Those with time on their hand. 3. The lazy ones / those that cant be active very often. So first you need to categorize yourself in order to achieve 700+ points average. After that, you should know where most your quests will be put in, with some quests that are easy and good points that work for everyone. We will start with the lazy people or those that won't have much time to play. You want to set an average of 100 points for a quest, in other words eventually reach 700/800 points depends on 7 or 8 attempts. If you have followed this guide so far, it means you should be stacked on guild coins and admin/guild quests. There is a quest for spend 500k coins for 112 or 102 we can't recall exactly, but still it's above our set 100 average. There is also a 132 points spend 1 mill coins, but if you're very lazy this fest, better get 2,500k as we reach for that 100 average with minimum effort anyways. Once you spent 500k coins, buy as many admin quests as you can. Assuming all your guildies are VIP 8 at least. They should do 8 admin quests per 1 scroll. There are a 100-120 points (depends on its time limit hence the range) do 150/170 admin quests. An admin scroll is 18k guild coins, for 160 quests you need 20 scrolls, so that is 360k+- coins for a 170 admin quest, that is without those scrolls that you should have already saved for that entire week or the 6-hour refresh. You shouldn't rush doing these as soon as fest starts, as fest is 1 week long so you'll get even more coins and scrolls stacked up during its duration, but by only doing these simple coin spending/scrolls, you should have at least 4 quests done just on these alone, +-1 depends how much you had saved before or if you do wish to spend a small effort for the greater good. So now we've covered the base for lazy people. Spenders come next, and they are very easy. As a spender, small or big, there is an easy quest for 100 points which is buying 3 special bundles, there is a higher point quest for buying only 2 special bundles but it doesn't appear frequently but if you are patient good for you. There's also purchase 4 specials bundles or the way to 10 with points averaging from 110 points all the way to 150 depends on the amount and quest time limit it varies, but easiest is no 100 points for 3 bundles, do note that I don't know if captain offer for 1$ applies but I'd guess it does. Also the bigger spender u are the more gems u should have, there are spend gems quests for 12500, 25k and 50k gems going 95 points, 115+- points (I can't recall the exact number) and eventually 141 points respectively. So it's worth holding on your gems for the fest ( if u can) or if u buy expensive packs during fest that provide an instant load of gems. Last we will talk about the guys who will do the heavy lifting, the guys (like I did this fest) who will score the highest and compete with each other for top spot in the guild. These will be the active members. If you are one of those, you will mainly want to be gathering. Any decent might player 10 mill+ core might have a sufficient gathering equipment ((neceos armor head and mainhand, nomad boots (regular equipment) and gryphon's talon. When fest starts you'll reset your talents so that you have to gather speed 2 and army capacity 2 maxed, you should also max speed and capacity 1 but that's up to your preference. The bigger your army is the less you should care about capacity, though fewer troops gathering = fewer troops being hurt in case of an attack. You will then find a place located in the middle of lvl 3 tiles/close to lvl 4 tiles, and that has a decent distance from the biggest hive around and relocate there, that'll be your home unless you find it is bad and random or relocates somewhere else. If you are in a decent guild and have decent might, you have 4 armies at least, a sufficient army of 150k+ troops and you haven't annoyed anyone lately, you should be gathering on lvl 3 and 4 tiles. Your gathering should be quick about 2 – 2:30 hours for lvl 4 tile and about 1:30 hours for lvl 3 tile. Best gathering quests are 143 points, their time limit is about 1 day and 5-20 hours usually can't recall exact numbers but you won't reach that far. Your goal is to finish a gather quest per day, if you can finish 3 in 2 days you are awesome :). Food gatherings I don't recall if there is a 143 points quest, but if there is it'll need 22+- mill food if I recall correctly, though for food there is a 152 point quest for 30 mill food which is the better choice. Fields are the easiest to find especially lvl 3 tiles, lvl 4 tiles are harder but still very possible to find one at least at peak hours. Fields also require the highest amount of troops to gather. Still, if you are active, doing a 152 food gathering is quite easy and will take you from morning to evening if u are active every time your gatherers are back to start a new one. for food lvl 3 tiles are 900k and for lvl 4 it is 1,565,000. Next up are woods and stone, their 143 quest need 15 mill wood/stone, it takes less time than food to complete, But at peak hours its harder to find lvl 3 tiles and especially 4, you will have to look for a while but don't go further than I'd say 120 miles, the travel time isn't worth it, also look up for tiles that are about to finish, as soon as one finishes, new one spawns somewhere close. wood/stone lvl 3 tiles are 720k and lvl 4 tiles are 1,240,000.
than comes 11,500,000 ore gathering for 143 points which is easiest in my opinion but not frequent at all to get, if you got this one lucky you, As ore rich veins are quite common. lvl 3 ore tiles are 540k and lvl 4 are 950k. Then comes the hardest one to get, 3,700,000 gold gather for 143 points. It is the easiest in my opinion though very nerve wrecking and you alll have to look far for tiles as gold tiles are not common at all as we all know. I've managed to get one, finished in like 6 hours with 4 armies gathering at all time lvl 3 tiles mostly. This sums the best gathering quests for the best gatherers with time on their hands, though we aren't finished. If u are lower might, ur gathering isn't high enough but you are active, your guild isn't strong, you lack shields to cover troops just incase when you cant be active when they finish gathering, you don't have enough troops to provide 4/5 armies, you only got 3 armies or whatever reason there is. You can locate yourself in a lvl 2/3 tile area so that both are available to you, you should have more tiles and less threat there. You will want to do 90-119 gathering quests, that needs less gathering but for an ok amount of time. For example 7.5 mill ore in about 19 hours for 119 points, or 10 mills wood/stone, 11.5 mill wood, you got the point. There are also gatherings that take 3 days, avoid those as you are a person with time and this isn't meant for you, I'll talk about these quests in just a bit. A 40 mystery boxes quest for 138 points or so if I recall correctly, if u are frequently active this should take you about 24 hours. There used to be a kill quest, this fest it wasn't there, but in case it comes back, good 100+ point quests for killing 100k/300k/500k troops. There is a 137 point send 120 helps, it's a good quest for everyone and doesn't take very long for active members in an active guild that is all in the same kingdom, but still u got to be online quite often to finish it fast. There's also 110+- for sending 80 or so helps so look out for this one as well. And a 91 point one as well. This is the best quests for very active players, so if u are going to be active, you gonna need to prepare for it. This fest I've done five 143 gather quests, one 152 gather quest, one 137 send helps quest and one 141 spend 50k gems quest, I have averaged the highest at 1145 points in 8 quests. Last I'll give special mentions to some quests that are good for all the types of players. 1. the send 137 point quest to sending 120 helps, for a decently active member in a very active guild, it should be easy doing in less than 24 hours, talk with your guildies maybe someone can start a bunch of low level researches or demolish a low level building and level it up so you can send many helps. 2. there are good building might quests for 80k and 120k might for building might that go well above 100 points for a quest don't recall exact number. If you are closing in on a high lvl building that qualifies for that quest, reserve one its ez points. 3. there is a quest for finish 1 hell event phase 3 for about 100 points or more depends on time limit. if you plan on doing one for it's rewards, good opportunity to do a fest quest as well. 4. research might works too if u are close on a big reasearch and there is a 100+ point quest that qualifies. 5. there is a coluseum rank up quest that goes from 90 points to 120 so it's a good one to do if u arent in the top 100 or so where it is hard to rank up. 6. theres 25 coluseum battles for 110 or so points, if u didnt waste attempts and are close to your daily refresh, and you can afford spending 250+250+400 gems so you can do this 25 battles quick, than go for it. 7. Even not as a spender, it's good idea to save gems for fest, 12500 gems for 95 is quite good and easy points. 8. If u are full on rss and a big supply rss quest comes up(100+ points), you can have a guild member sit next to you and send rss back and forth, you'll lose less rss the higher your castle but it's a guild game, your guild can help you send you unneeded rss so you can do it. 9. Remember this 122 quests or lower that take 3 days ? if u arent very active or low on rss gather speed or armies, or a lazy person, you can do this one, not every quest should be instant, you can afford spending some time gathering help the greater cause. If you're aiming for Tier 20, have the R4s delete all quests sub 90+- at the beginning of the fest, don't let those who don't care screw you with a 40 point quest . You can drop the requirement at the last day or 2 to 80+ or something your call, that is all in case you want to reach tier 18+ obviously. Avoid 146 points 32 cargo deals as it takes 2-3 days to do no matter what, unless you are a spender or someone who spent most his tries at the first 2-3 days anyways. Avoid training troop quests or quests that u know will take 2-3 days unless they are very points. especially avoid more than 1 hell event for a quest unless u are stacked on speedups or gems to do so quickly xd. same goes for solo events. I think that's it lords, that'll be all for my guide to reach tier 20 in the next guild fest. As you can see, everyone can contribute to reaching the cause even the laziest of them all. So get your guild to read this guide and wish you the very best of luck. Enjoy your big rewards :).